Our seat covers fit so well, people will think you have factory installed leather seats! Clazzio seat covers fit extremely well over your existing seats and is a luxurious upgrade for any truck. 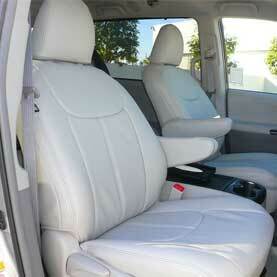 Enjoy being in your truck with our leather seat covers. Our seat covers fit so well, people will think you have factory installed leather seats! As you know, all seats are not the same and for that reason, our manufacturer has developed thousands of specific applications to make sure each seat cover is mapped for a perfect fitment on your truck. These slip-on seat covers are easily installed and will make a dramatic difference on how you enjoy your truck. Even though they are truck seat covers, people won't be able to tell that they are just seat covers and will think your interior is a true leather upgrade from the factory. Do I need to replace the fabric on my seats, or do these slip on? These leather seat covers are 100% slip on seat covers and do not require removal of your existing seat material. How do I install these seat covers? Installation instructions are included for your specific application and takes around 2-3 hours for full interior installation. Some vehicles do require cutting in certain spots like the power seat control panel, but nothing too major. Do these seat covers make the seat more comfortable? Yes! These truck seat covers include .5" of memory foam to give you a more comfortable seat and more cushion. What is the warranty on these Clazzio seat covers? Clazzio offers a 1 year warranty that is honored on any manufacturer defects. This does not include normal wear and tear that comes with use on these seat covers. What all is included with a two row seat cover set? You will receive the full interior seat cover set which includes bottom cushion covers, top cushion covers, head rest covers, and depending on the vehicle, arm rest covers. It is a total makeover. What about straps to fold down my seats and lumbar support knobs? Since Clazzio seat covers are manufactured for every application specifically, they account for features like these in your interior. For straps to fold down seats, they will include a cutout for those to loop through. For bottom plastic trim on your front seats, the covers are meant to tuck in to those for a great, OEM+ fitment. Is the entire seat cover made of leather? No, only the center insert is made of leather (if you order a leather set). The rest of the seat cover (sides and rear) is made of high quality PVC. The only leather portion on a leather seat cover set is the perforated middle portion. The PVC is still a very high quality material and it is hard to tell the difference between PVC and leather on our leather seat covers. How can I keep my Clazzio seat covers clean? What Exactly Are Clazzio Seat Covers? They are simply a slip on seat cover that transforms the look of your interior. These truck seat covers simply install over your existing seats and no removal of your fabric is needed. The seat covers are also known to increase your truck's resale value. I Don't See My Truck Listed - Can You Get Covers For It? Maybe! Contact us to see if your specific vehicle isn't listed on our site, or if you have any questions about the application. It depends if you ordered a custom set or not. If you ordered a set that is in stock, then it will reach you in approximately 5-6 days via UPS ground (continental U.S.). If you ordered a custom set, then it will take 8-10 weeks (occasionally longer) to arrive from Japan due to custom manufacturing, freight time, and US customs holding time. View our video on our Clazzio Seat Covers, what they are, how to install them, and why Clazzio Seat Covers are the best truck seat covers on the market!